Alternative art schools: a threat to universities? Open School East, Hackney, part of a boom in alternative schools. Students pay no fees but give time to community projects. A former library in Hackney may seem an unlikely venue for London’s most talked-about new art school. The 1970s Rose Lipman building lacks the architectural wow factor of Central Saint Martins King’s Cross campus, but demand for places on the postgraduate Open School East in De Beauvoir town is high. The year-long programme boasts visiting lecturers, including the curator of contemporary art and performance at Tate Modern, Catherine Wood, and artists such as Pablo Bronstein and Ed Atkins. And, at a time when art MAs in the capital cost up to £9,000 a year, the students pay no tuition fees. 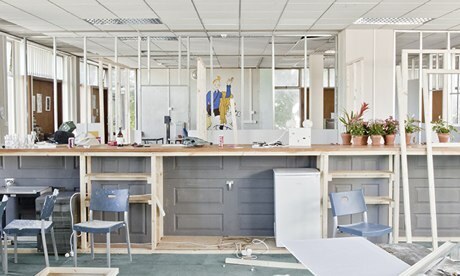 The project, which opened in September, is the latest alternative art school to be established in the UK. Open School East co-founder Sam Thorne, an associate editor of Frieze magazine, says their recent proliferation has been driven by the rise in fees and a growing disillusionment with university art education. Some, such as the Islington Mill Art Academy in Salford and the School of the Damned in east London, were set up by art students and recent graduates who could not afford rising course fees and were dissatisfied with the structure, ethos and curricula of traditional art degrees. In return for a year’s free tuition and studio space, the 13 associate artists at Open School East will give one day a month of their time to community activities in the borough. “Their personal practice might become a community project or they might give lessons, such as dance or furniture design, to local people,” says curator Anna Colin, another co-founder. Many of the school’s lectures and workshops will run in the afternoon and evening to encourage local residents to join in. As these alternative courses take off, how will the established providers respond? Simon Ofield-Kerr, vice-chancellor of the University for the Creative Arts in Kent, believes the trend poses a challenge at a time when there is a “real danger of postgraduate study being devastated”. “Over the next two years, we’ll all be looking at the future of postgraduate education and how this phenomenon will affect the balance of provision,” he says. And the issue will become more pressing after the first cohort of undergraduates to pay tuition fees of £9,000 per year graduates in 2015. “It’s not something that can be ignored or defended against,” says Ofield-Kerr. It is not just art students who are developing alternative schools. Major art institutions, including the Tate and the Hayward and Serpentine galleries, have experimented with the school model in their education programmes. Open School East is backed by around £110,000 from the Barbican and Create London. The Silent University, an alternative school for refugees and asylum seekers, set up by Turkish artist Ahmet Ögüt during his residency at the Tate Modern last year, now runs courses in several European countries. The artist Ryan Gander has drawn up plans for a postgraduate art academy that would give preferential consideration to poorer applicants. He says the school, called Fairfield International, would level the playing field between students from disadvantaged backgrounds and the “trustafarian rich kids” whom he fears increasingly dominate the major art schools. Based in a former Victorian school in Saxmundham in Suffolk, where Gander lives, it will offer free studio space and accommodation for 12 students a year and offer tuition from renowned artists. WRITER: by David Batty on The Guardian website.